Remove stems from mushrooms and finely chop stems. Heat olive oil in a skillet over medium heat; cook and stir chopped mushroom stems, shallot, and garlic until softened, about 5 minutes. Pour wine into the skillet; cook and stir mixture using a wooden spoon until liquid is evaporated, 1 to 2 minutes. Cool mixture to room temperature, about 10 minutes. Preheat an outdoor grill for medium heat and lightly oil the grate. 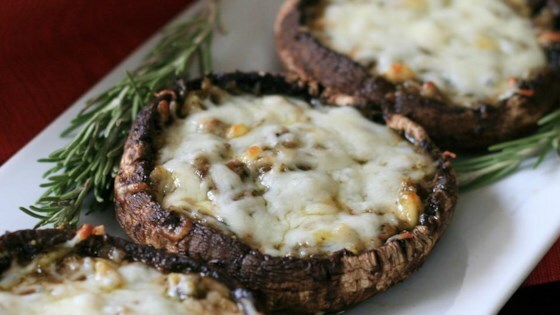 Brush the olive oil mixture over the top each mushroom and place, top-side up, on a grilling pan. Mix pesto and pine nuts with the mushroom stem mixture together in a bowl; spoon into each mushroom. Sprinkle Italian cheese blend over the filling. Grill mushrooms on the preheated grill until edges are blackened and stuffing is bubbling, about 10 minutes. Grill mushrooms over open flame or smoldering charcoal (medium heat) from alder, cedar, or other fine smoking wood, depending on the flavor you desire. Any white wine can be used in place of the Chardonnay. Per Serving: 282 calories; 20.2 g fat; 15.4 g carbohydrates; 14.5 g protein; 20 mg cholesterol; 297 mg sodium.